Complete guide to all the Bordeaux Chateaux in the original 1855 Classification classified as Fifth Growth. Perhaps the classification of Fifth Growth Bordeaux wine creates the most conversation today. While numerous Bordeaux producers are making the best wines in the history of their estates, when you look at the progress made by producers at each level of the classification, clearly the wines classed as Fifth Growth Bordeaux have made the most progress. This is seen not only in the wines, but in the prices consumers are willing pay for the wines. The links on the left side of the page bring you detailed profiles of all Fifth Growth Bordeaux producers. The pages offer numerous, wine tasting notes, information on the vineyards and winemaking, images, detailed histories and wine buying guides. There is no discussion. Chateau Pontet Canet is leading the pack in the race for quality for Fifth Growth Bordeaux. In fact, if a reclassification of the Medoc were done today, Pontet Canet, thanks to the tireless efforts of Alfred Tesseron would be reclassified as a Second Growth! Pontet Canet is not the only Fifth Growth Bordeaux producer deserving of an upgrade; Chateau Lynch Bages, Chateau Grand Puy Lacoste, Chateau Clerc Milon, Chateau d’Armailhac and others would be upgraded, or at least should be elevated as well. Regardless of the classification status for any Bordeaux producer, the market is going to set the price. Clearly the market has spoken because the wines of Pontet Canet and Lynch Bages can be priced as much or more than many of the Second Growth wines! Today, the wines of Chateau Pontet Canet are viewed by many tasters as the best Fifth Growth producer. 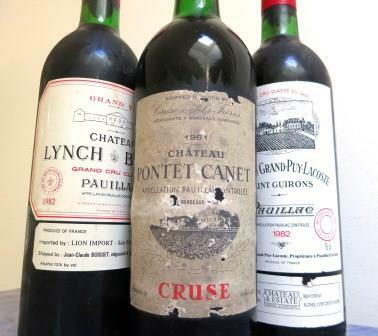 In 1855 Bordeaux, when people in the Bordeaux wine trade, primarily Bordeaux negociants were asked to put together an official classification of the top wines from the Left Bank, one of the most important statistics they considered was the actual sales prices for their wines covering a period of 40 years. They chose 1815 to 1855. To give you a look at what the sales prices were at the time for not only Fourth Growth Bordeaux, but for all the levels of wine in the 1855 classification of the Medoc. First Growth Bordeaux – Prices over 3,000 French Francs per barrel. Second Growth Bordeaux – Prices between 2,500 and 2700 French Francs per barrel. Third Growth Bordeaux – Prices between 2,100 and 2,400 French Francs per barrel. Fourth Growth Bordeaux – Prices between 1,800 and 2,100 French Francs per barrel. Fifth Growth Bordeaux – Prices between 1,400 and 1,600 French Francs per barrel. To help you understand the meaning and intent behind the term “Fifth Growth Bordeaux,” you can look at it like this, as a general idea. The 1855 Classification placed the top wines of Bordeaux in five different ranking categories. The ranking categories were called Growths. A wine with the ranking of First Growth was considered the best wine in Bordeaux. The top wines of Bordeaux, a First Growth was awarded an A+, a Second Growth is an A-, a Third Growth is a B+, a Fourth Growth is a B and a Fifth Growth is a C+. With the exception of an A+ for the First Growths, the grades may or may not be strictly applicable today. It’s going to depend on the specific chateau. But by using the grades, they will provide you with a good idea on what the term Fifth Growth means in relationship to the other levels of Classified Growths in Bordeaux. Out of 61 different Bordeaux chateaux that were classified in 1855, a total of 18 chateaux were classed as Fifth Growth Bordeaux. That is more than every other level of classification. As we wrote earlier, if a new classification were ever put into place by the chateau, along with cooperation of the INAO and French Government, you would see a lot of changes made, both up and down. In my opinion, there are 8 Fifth Growth chateaux that deserve to be promoted, 2 would be demoted and the others would remain the same. However, you would also see other estates that are currently classed as higher growths demoted to Fifth Growths, leaving you with about the same number of chateau in the category and ranking. It will probably never happen. But it’s fun to think about it.